Seriously, what’s wrong with this picture?? We have nine hens and no cockerel. I would love to have a cockerel but can’t because of the neighbours. I woke up 5.45am this morning by a Kuckeliku(cuck-a-doodle-do). First thought was there must be an escaped cockerel on the loose. A second kuckeliku, louder this time. Out of bed and look out the window, there’s Esme from Essex on the top of the compost kuckelikuing!! Somehow I had missed her closing the hatch yesterday, I often think I should control count them every evening but rarely do, she must have been up in the tree. We have always joked about her being the leader hen and thinking she is a cockerel but I would never have guessed she would take her roll so seriously!! She is most definitely a hen. I have seen her laying eggs and she doesn’t have long tailfeathers. Her comb has always been a bit bigger than the others but no other estetical signs of her being anything else than a hen. Holy cow, I don’t know what to do next. I’m still shellshocked. 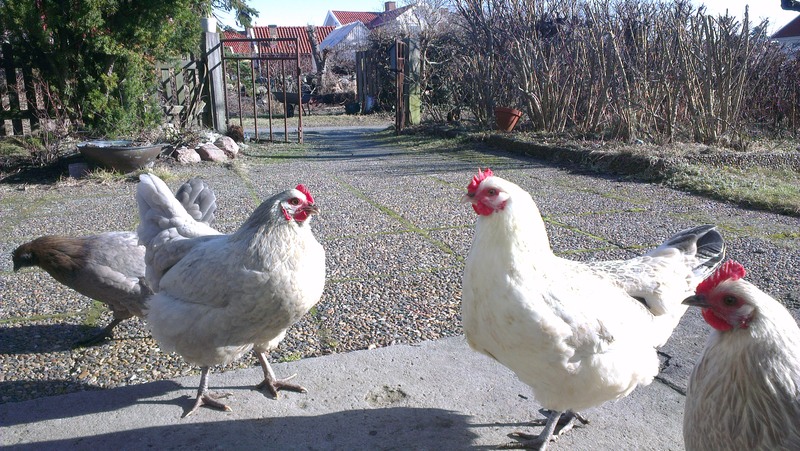 This entry was posted in Hen island, The island and tagged cockerel, hönö, hedemora, hen, transgender chicken. Bookmark the permalink. It’s Esmes – our Esme is also top hen… although she hasn’t quite started crowing yet!